We're glowing after a very successful WeDigBio and have you all to thank for making it so. It warms our hearts to read of the many, many tangible accomplishments -- the projects getting completed, the transcriptions and georeferences rolling in, and all the digital data that are getting added to your invaluable biodiversity specimens. It's equally exciting to hear about the communities developing and growing around your collections, institutions, universities, and organizations. We hope to continue to see you online, contributing to transcription platforms and supporting collections! Thank you hosts for taking the time and resources to organize events. We know this is a significant ask and appreciate your willingness to be a critical hub for WeDigBio events. Thank you citizen scientists, onsite and online, for taking the time to digitize with us, for sharing your experiences on social media, and for joining us on Sococo. Data point by data point, you're helping to mobilize centuries of biodiversity information. Thank you transcription platforms -- CitSciScribe, DIY History, DigiVol, Les Herbonautes, Notes from Nature, Smithsonian Institution Transcription Center and Symbiota -- and SciStarter for hosting and supporting projects and events, advertising, and interfacing with WeDigBio. If you hosted an event, please complete our host survey. Your input helps shape future events! If you have any stories from WeDigBio 2017, please share them with us at wedigbio@gmail.com! We'd love to do a few short blog posts with highlights, funny collections findings, or how collections are being used in your research. If you have high resolution photos you can share with us, please place them in this shared folder. We use these photos for advertising future events and in WeDigBio materials, so please be sure they have the appropriate permissions. If you have other products from your event that you'd like to share with us, such as games, educational lessons, advertising materials, etc., please do so in the same shared folder. We'll be crunching numbers for a little while and will update you when we have our results. In the meantime, check out the very impressive WeDigBio dashboard displaying estimates of where transcriptions were taking place, and how many were coming in. What's next, you ask? Keep transcribing! And continue to follow us at wedigbio.org, on Twitter, and on Facebook for updates and information. 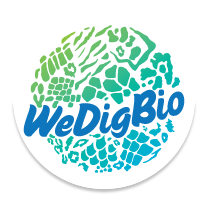 We're already starting to think about WeDigBio 2018 and hope you are too! Contact us at wedigbio@gmail.com with feedback and questions, to learn more about how to get your specimen images online, how to use BIOSPEX in your digitization workflow, or just to say Hi.